Similar to my protagonist, Ted Callan, Tilda doesn’t appear in the myths, not specifically, anyway. The fortune telling and fate spinning Norns, however, certainly do. My fascination with fortune telling and precognition was always tempered by potential downsides, a feeling that probably came out of the various comics I read and RPGs I played. The X-Men definitely took a turn for the more fatalistic after “Days of Future Past” knowing what was in store for them (in at least one of their futures, I’ve read X-men for thirty years and even I can’t keep it all straight anymore). I also had a sadistic gamemaster who’d punish you for using those very helpful powers and spells because they required more planning on his part. You know who you are. Tilda showed up out of the blue in Ted Callan’s life and world. She popped up just as suddenly in my writing, there was no short story antecedent. One moment there was a dark highway, and then there was Tilda. She didn’t live in Gimli until that popped out of her mouth. 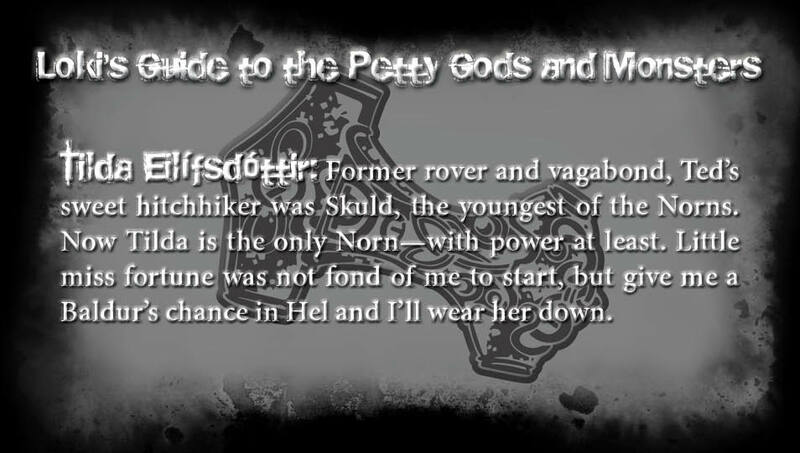 I sort of knew I wanted a fortune teller of some kind to be a part of the book eventually, but just as the dwarves weren’t dvergar yet, that seer wasn’t necessarily going to be one of the “capital-N” Norns either. I had a friend who used to hitchhike all over the place. She scared the bejesus out of me at times, but she was fun, and she had some great stories. She had seen some amazing things in her travels, and while Tilda is not her, there is definitely something of that friend in the young Norn’s literary DNA. I wanted Tilda to have a wealth of stories in her past, and to be more knowledgeable about not only the magical world, but the real world than Ted. Her broader life experience also helped close the age gap between them. Tilda gets all of the powers of the Norns, visions of not just the future, but the past and the present as well. I did this because Ted gets a lot of power in Thunder Road, and I wanted Tilda to be Ted’s match both physically and magically. Even though the book is about Ted, Tilda needed to undergo a journey of her own. And just as I wanted to write a post-Ragnarök story, I liked the idea of playing with the maiden-mother-crone concept. Mixing the magical and the mundane is one of things I love most about writing Urban Fantasy. Ted and Tilda fell together very quickly, fueled in part by the Norn’s belief that they are fated to be a couple, so in Tombstone Blues I wanted to examine how much “destined for one another” means when you move in together for the first time. This entry was posted in Uncategorized and tagged Days of Future Past, Loki's Guide to Norse Mythology, Norns, Ted Callan, Thunder Road, Tilda Eilífsdóttir, Tombstone Blues, X-Men by chadwickginther. Bookmark the permalink. I know who I am? How dare you call me sadistic! The next time we game, you’re in such trouble, buddy, you have no idea the torment that’s in store– oh, wait. I see what you mean.